Ten minutes after I’d finished facilitating a large national association meeting hour-long discussion on solutions for a persistent industry problem, the conference education director walked in. His jaw dropped. “The attendees are still here talking to each other! That never happens!” he exclaimed. Well it happened this time. Many small groups had formed and people were chatting energetically. Business cards were being swapped. When I left to catch my flight home twenty minutes later, conversations were still going on all around the room. How did I build and support this level of interaction and engagement? I used a fishbowl sandwich. What’s that? Read on! A fishbowl sandwich, like any good sandwich, has a filling surrounded by bread and spread (or accompaniment). The filling is the fishbowl technique, the surrounding bread is comprised of pair-shares at the start and end, and the accompaniment is the facilitative language that segues between the bread and the filling. As people trickled into the room I asked them to pair up by sitting next to someone, preferably someone they didn’t know. I lightly repeated the request several times before the session started. For the first piece of sandwich “bread” I asked everyone to think of something they had done, small or large, which was a (probably partial) solution to the challenges the industry faced. After about 30 seconds I asked one of each pair’s members to spend 30 seconds sharing what they had done with their partner. A final 30-second share from the second partner to the first wrapped up the opening pair-share. As usual, it was hard to get everyone to turn back to the front of the room for the next bite of the sandwich! At this point, everyone had switched, at least for a while from “listening” to “participation” brain mode—they were ready to engage. 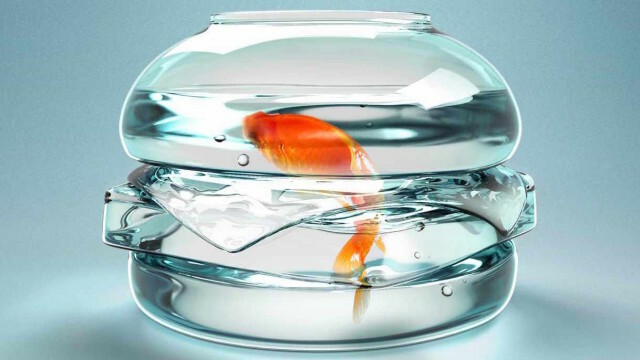 Time for the fishbowl. You can only talk if you’re sitting in one of these chairs. If you have something to say, come and sit in an empty chair. You don’t have to wait for someone else to finish talking. When you’ve finished what you have to say (for the moment, you can always return) vacate your chair. If all chairs are full, when someone new walks up, the person who’s been talking longest should leave. And we were off. For the next fifty minutes a constant stream of people came up and shared their ideas and experiences. Sometimes they shared with the audience; sometimes they spoke with each other while the audience listened. No one “hogged the mike”. A woman wearing a large backpack shared a novel approach that could be implemented regionally. I ran a hand poll to see how many people had done something similar—only about 20% of the audience. I asked those who hadn’t how many would be willing to do the same. Most hands went up, and people looked thoughtful. An industry leader told the woman he wanted to interview her for the association’s national magazine. After about 40 minutes I said that we had heard an incredible amount of good ideas and advice and it was clear that there was a tremendous amount of expertise and experience in the room. I asked if anyone wanted help with specific problems. Two brave souls came up and shared their individual frustrations. Sure enough, several folks came up and supplied helpful suggestions. It was time for the final pair-share slice of bread. To conclude, I asked each pair member to share with their partner their single best takeaway from the session. Once again, a buzz of conversation arose, and after a couple of minutes I announced that the session was over. That’s the fishbowl sandwich. Have you used one, or something similar, at your events? Share in the comments below! Image adapted from a MacDonalds ad. Hope that’s OK, Giant Corporation. This entry was posted on Monday, January 25th, 2016 at 7:45 am	and is filed under Event design. You can follow any responses to this entry through the RSS 2.0 feed.You can leave a response, or trackback from your own site.